The man who played Cruz Lopez (photo, below left) is Epiphany Lopez or "Epie" from Potrero (though no relation to Cruz). “My family has been in San Diego since 1769,” he proudly exclaims looking like a Californio in his period dress. He is related to the Machados, who were among the first families in Old Town, San Diego. His wife, Lolie Lopez, is also a reenactor who portrays women of the period. Epiphany Lopez has been a “gunfighter” since 19 82, back when the Gaskill Brothers Gunfighters used to be called the Campo Gunfighters. His cousin, Jaime Lopez, a retired federal wildfire fighter, has also recently joined the group. For years, he watched Epiphany act in skits and it eventually, "roped him in." Jim Garza (photo, top of article, left) has been with the Gaskill Brothers Gunfighters four years. He describes how he began putting together his outfit, piece by piece. Careful preparation adds authenticity to the reenactment. "I made the pants and jacket myself,” he says, “and I made the gun belt and the holster with leather-working tools." He then crafted a persona: Santiago Rawlins, of Welsh and Mexican descent. 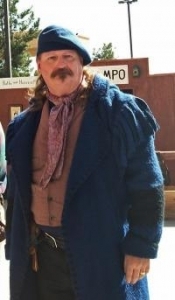 Taking facts from his own roots and weaving them with stories he researched of the Old West, he put together his new identity. Santiago is the Spanish equivalent of James, his own name. (In the Campo Gunfight, he played a member of the Chavez gang.) “Santiago” is a Southern Texas and Northern Mexico vaquero. “My Mom’s Welsh and my Dad’s Mexican. For my character, I switched that,” said Garza, whose own ancestor fought in the Mexican-American War, and met his wife around the time of the Battle for Mexico Cit y. He was wounded and she was a nurse taking care of him.